You may have so much on your plate today that it feels like “rush rush rush” for you as you scramble to get things accomplished. The Eight of Wands is all about action, progress and momentum. It’s about getting things done and making things happen. While it might feel to you like there just aren’t enough hours in the day, you could be surprised when the day is over to see how much you really accomplished. The Moon is in Sagittarius today. Although it’s not quite full, it’s getting there and will be by the time the weekend rolls around. Think about what it is you want to accomplish right now. The Eight of Wands encourages you to take the initiative and to get the ball rolling. The Moon in Sagittarius also works well with this energy: both the imagery of “wild horses” and the idea of travel. This is not the time to sit home and let your thoughts gather dust. Instead it’s about making sure your get up and go actually goes somewhere — whether that means tackling a mountain of chores or heading off on an exciting new adventure. 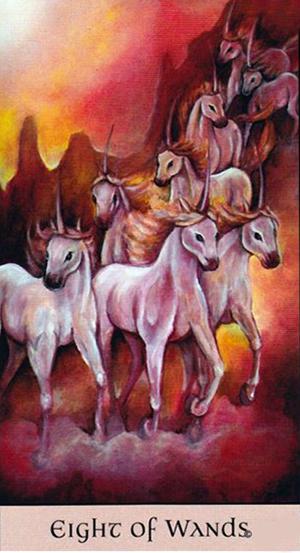 Today’s card — Eight of Wands — from the Crystal Visions Tarot by Jennifer Galasso, was used by generous permission. This beautiful deck — and individual prints — can be purchased directly from her Shop. Please visit and “like” her Facebook Fan Page. This deck — published by U.S. Games — is also available as for download through the Fool’s Dog website.